It wasn’t long before Silva had a hold onto Irvin’s leg as he connected with a leveling kick. He landed squarely on Irvin with a straight right hand that took him down in the Octagon at the Pearl. The final quick punches made the referee step in put a quick end to the fight. Irvin has fought as a heavyweight in the UFC. Silva made short work of the strong chinned Irvin and proved he’s the strongest pound for pound fighter. This win gives Silva eight wins, including seven since his signing into the UFC. Six of the previous fights have been by knockout. His next fight could be in September against Patrick Cote of Okami. Anderson Silva winner by Knock Out at 1:01 in the 1st round. Frank Edgar winner by Unanimous Decision at 5:00 in the 3rd round. CB Dollaway winner by Submission (Choke) at 3:58 in the 1st round by peruvian necktie. Brad Blackburn winner by Technical Knock Out at 2:29 in the 2nd round. Cain Velasquez winner by Technical Knock Out at 2:02 in the 1st round. Shannon Gugerty winner by Submission (Choke) at 3:33 in the 1st round by rear naked. Kevin Burns winner by Technical Knock Out at 3:35 in the 3rd round. Tim Credeur winner by Technical Knock Out at 1:54 in the 1st round. Nate Loughran winner by Submission (Choke) at 4:21 in the 1st round by triangle. Brandon Vera winner by Unanimous Decision at 5:00 in the 3rd round. 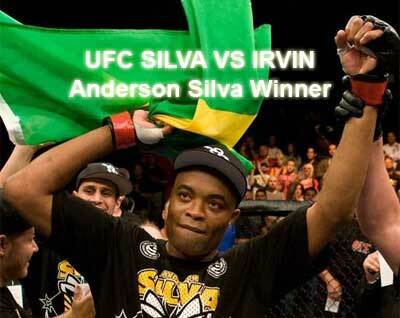 UFC SILVA vs IRVIN: Anderson Silva is winner with 61 second knockout.